If you’re going to Austin this year for SXSW and you’re a fan of coworking, you might want to arrive a few days early to hit the Global Coworking Unconference Conference (formerly known as the Coworking Unconference) being held in the city on March 8. With a range of panels on starting and running a space, the all-day event is geared toward owners. But at least one discussion might be of interest not only to coworking entrepreneurs but also to forward-thinking managers as well. As more and more workers take up the promise of technology and get out of the office to work where and when it suits them, employees’ needs for their company’s office change radically. Cubicles fall in importance as many opt to stay away from the office when they want to grind out work in isolation, and the remaining spaces increasingly need to be designed to foster collaboration. Enter coworking, whose very existence is predicated on the idea of providing spaces to break down isolation and get workers’ creative juices flowing. What lessons does the movement have for corporate types looking to create spaces that foster collaboration? GCUC is featuring a panel entitled “How to Design, Build and Grow your Space for Collaboration” and to get a sense of what answers it might offer for those providing corporate spaces to increasingly nomadic teams, we spoke to two panelists — architect Jerome Chang, who is also founder of BLANKSPACES coworking in Los Angeles, and Harvard-trained designer Sidi Gomes, who is the founder of ParallelCities.com — for a sneak preview. Both said those interested in the future of office design should pay plenty of attention to coworking. Chang agrees, calling Zappos’s new campus (s amzn) for example, “a great extension of coworking ideals.” How so? Change explains that “Zappos is looking to build a whole mini-city community by having encouraged a lot more people to live, work and play all in the same area as their office. The surrounding community becomes the campus itself.” That’s an idea more companies may want to explore. Not only are the ratio of workers to square footage and the relationship between campuses and their surrounding communities set to change, but so too is the balance of private to public spaces within offices, according to both Chang and Gomes. And coworking has something to teach companies here too, they feel. Collaboration is all well and good, “but true creativity really comes from privacy and reflection,” according to Gomes. “Imagine Frankenstein being developed in a public lab. You need the privacy of a basement to do that.” But this creativity-protecting cocoon of privacy needs to be balanced with idea-sparking sociability. “If you were always locked up in a basement, you would never get the idea to create Frankenstein to begin with,” he continues. 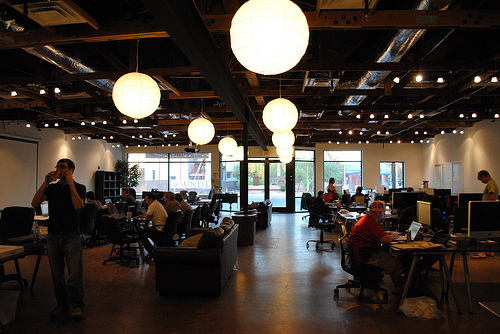 Coworking can provide a template for corporate offices looking to get this fine balance right. “The cool thing about coworking spaces is that ‘privacy’ is achieved in an open floor plan setting, because you are surrounded by people you don’t know, and therefore are not expected to talk to, so you can put your head phones on and go heads down,” explains Gomes. Could a bustling corporate campus housing three times as many folks as a standard office and with people coming and going at less regular hours offer the same advantages of meeting stimulating (relatively) new people combined with the privacy of proximity to near strangers that coworking does? Image courtesy of Flickr user .dh. I just read an interesting article on how large companies are embracing co-working: http://newsroom.cisco.com/feature-content?type=webcontent&articleId=656348. Food for thought on the future of work.